Technically this is not a "road" marathon as the entire course is on dirt and gravel. But it's as fast as a road course. Faster than most. The start of this race is at the Iron Horse State Park Hyak Trailhead. You run a quick out-and-back (presumably to make this course length official as it is a USATF sanctioned race and a Boston Qualifier) and then you head into the old train tunnel. For a visitor or someone that has never been in the tunnel this is pretty cool! But just figuratively, the temperature in the tunnel is actually pretty modorate and stays surprisingly constant (in the low 50s) all year round. 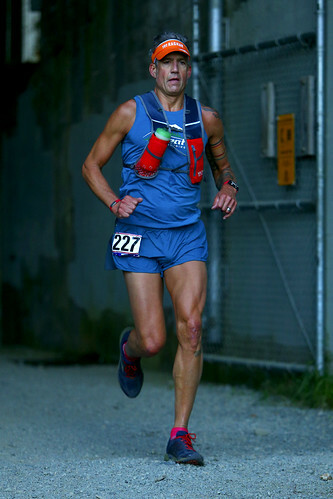 The race organizers recommend that you bring a light since the tunnel is about 1.75 miles long but I was running in a small pack and would not have needed mine at all. As you exit the tunnel you can put your light in a small drop bag and hand it off to a volunteer who will return it to you at the finish line. I opted for a small handheld light and just stuffed it in the elastic pocket of my running vest so didn't even need to slow down. There are aid stations every 2.5-3 miles along the course so you are very well taken care of. They all had a sports drink and water and might have had something else too but I'm not sure as I was never looking for solid food. 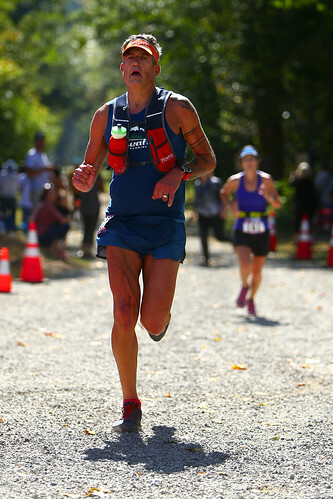 Just like I have started doing lately for ultras, I carried all my nutrition for this race in my vest. And once again this strategy paid off big time. Not only was my pacing right on but so was my nutrition. Funny how it took running to really teach me how to eat and drink while exerting myself whereas while I was racing bicycles I felt I had more wiggle room and did not have to be so strict. But that might also have to do with my age (I'm older now) and the fact that your guts are getting bounced around more when you run. At the start I was hoping to run sub 3:30. That just happens to be the Boston Marathon qualifying time for my age bracket. ASIDE - I find it funny that signing up for an ultra doesn't bother me at all but as soon as I signed up for this marathon I got nervous. Going through the tunnel was all about perceived effort as your GPS watch is pretty useless underground. Once I exited the tunnel I could tell I was just slightly ahead of my scheduled pace but not so much that I was worried about slowing down. At the time it felt pretty relaxed. In the past I have been just as guilty as most everyone else of starting too fast but over the years I have gotten better and better about sticking to the plan. So much so that I let some people run away from me today. At the halfway point I had drained my bottle so needed to fill it back up. This was the only time that I stopped running. But it wasn't long. As I approached the aid station I ripped open my single serving envelope of HEED and by the time I got to the water cooler my bottle was unscrewed as well so all I had to do was dump in the powder, fill it up and screw the cap back on. Go! One of the people I had resolved not to run down was not maintaining a very steady pace and so we would get closer together at times and then at other times they would move ahead. As I approached the halfway aid station this person didn't stop but they got there just ahead of me so when I departed they were not very far up the road and this time, having felt super comfy at my previous pace, I accelerated. Just a touch. I think it took me about one mile to catch them but I was feeling really good and when I did I tried to dial up the pace just a fraction more. As a runner my sense of pace is still not very acute. I have to look at my watch pretty frequently to be sure I am on track and even then, with GPS watches only being so accurate, my pace is not an exact science out on the trail or road. That said, I was pretty confident that over the second half of the course I kept slowly speeding up. Around mile 15 I still felt pretty good. At mile 18 I felt okay. At mile 21 - where the course exits the John Wayne trail and enters the Snoqualmie Valley Trail, I was not feeling quite so spry anymore. But I was still trying to accelerate. At around mile 13 some volunteer was shouting out your pace as you ran by and when I passed he told me I was on track to run 3:17! Not sure how accurate this was at the time but I was resolved to at least now slow down and hopefully even speed up just a tad. I have always wanted to run a 3:15 and today just might turn out to be that day. ANOTHER ASIDE - the last time I tried to run a 3:15 marathon I blew around mile 21 and ended up finishing in 3:24. Ever since then (four years ago) 3:15 has been my goal. Those last five miles of the course were not as downhill as I remembered them. I have ridden this section numerous times and run it once. On a bike it was a breeze each time and when I ran it this was a huge chore. Today was also a pretty big chore as all the sections of descent are broken up by bits of flat and having to push while on the flats was killing me by now. A real conscious effort. One thing that helps me push are carrots. Seeing people up the road and slowly reeling them in is a huge confidence boost and luckily there was no shortage of carrots here. I passed more than one person who I thought, after seeing them at the start, were likely candidates for the overall win. And here they were walking! With about three miles to go I saw a big group or runners and with two to go I could tell one of them was the 3:15 pacer. Must. Go. Faster! At mile 25 I caught the 3:15 pacer and in just that time his group had evaporated. Two people had run up the road and the rest had dropped back and were now behind me. At this point I was not sure if I could catch anyone else as I felt like I was on the edge but so far I had not slowed down so I tried to at least maintain my effort. I crossed the line and as this little kid hung my finisher medal around my neck I could feel my legs start to lock up... I hobbled over to the area where our drop bags were to retrieve mine and my recovery drink all the time marveling at how sore running this distance makes me. As I sipped my recovery drink I found a friend that had run as well. Nice! And another who had paced him. Very cool. The bus shuttle back to the parking lot where we had left our cars was wasn't super comfy. My quads were not only sore but they were also twitching. A very strange feeling. Unfortunately I have no pictures! :( That is one bummer about trying to run for time. Everything about this race went well. - The weather was perfect. mid 50s at the start, mid 70s at the finish with just a slight headwind during the second half. - My gear all worked well, I'm glad I chose trail shoes for the protection from all the rocks on the road. - My nutrition was dialed in! Could not have been better. - I lucked out with my pacing, I started just a tad faster then planned AND managed to speed up. Pretty much every mile was just slightly faster than the previous one and I finished going as fast as I could. Fantastic work Martin! And excellent write-up.